Minneapolis protests against U.S. wars | Fight Back! Minneapolis, MN - Over 50 people joined a Minneapolis anti-war protest on March 19. The protest was called to mark the 13th anniversary of the March 2003 'shock and awe' bombing of Iraq, the start in 2003 of the U.S. war in Iraq. The protest was organized under the call of Say No to Endless War - Iraq, Syria, Libya, Afghanistan, Somalia. “Endless Western military interventions in the Middle East have brought only destruction and division,” said Sundin. The protest was held in the West Bank neighborhood of Minneapolis. Many neighborhood residents are Somali immigrant families. As the rally and march went through the neighborhood many people came out to show their support for the anti-war message of the protest. Several TV stations sent staff to cover the protest. 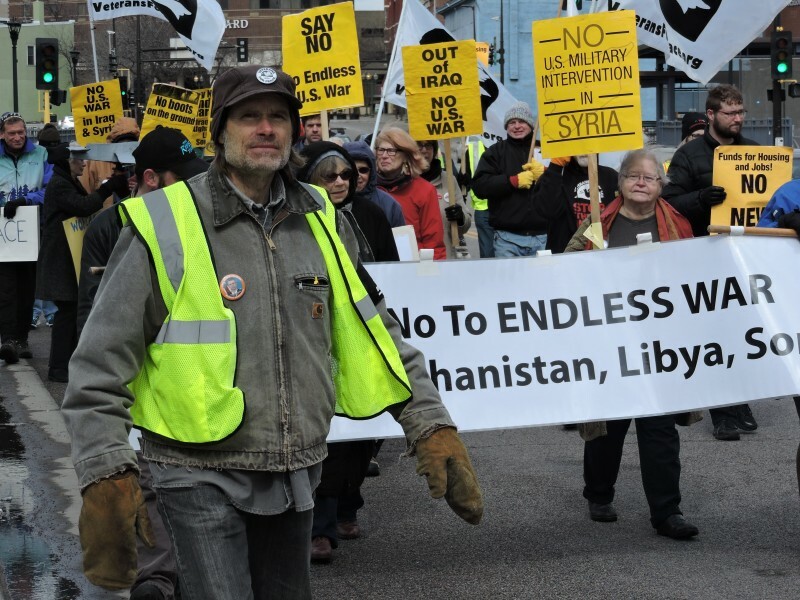 The Minneapolis March 19 protest was initiated by the Minnesota Peace Action Coalition and endorsed by a range of peace and anti-war groups including Anti-War Committee, Twin Cities Peace Campaign, Veterans for Peace and Women Against Military Madness.